The uninsured rate has fallen among all racial and ethnic groups under the Affordable Care Act with steeper declines among people of color compared to Whites, according to a new analysis by the Kaiser Family Foundation. The findings for Hispanics were especially striking. Between 2013 and 2015, the uninsured rate for Hispanics fell from 26 percent to 17 percent – a sharper decline than for any other group. Nationally, the total number of nonelderly uninsured fell from 41.1 million to 28.5 million, reducing the overall uninsured rate from 15 percent to a historic low of 10 percent over the period. 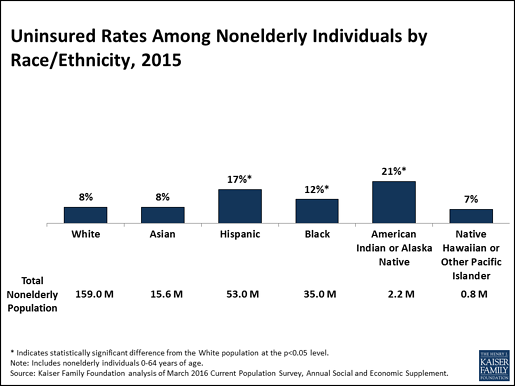 Despite such gains, however, non-elderly Hispanics, Blacks and American Indian and Alaska Natives still remained more likely than Whites to be uninsured as of 2015. American Indians and Alaska Natives and Hispanics were at the highest risk of being uninsured (see figure). Sixty-seven percent of nonelderly uninsured American Indians and Alaska Natives are eligible for such help. Nearly half (47%) of nonelderly uninsured Blacks are eligible for coverage, but they are twice as likely as uninsured Whites (20% vs. 10%) to not qualify for help because their state did not expand Medicaid. The shares eligible for coverage are lower for Asians (34%) and Hispanics (33%) because they include more noncitizens that do not qualify based on immigration status. Coverage is more available under the ACA, but more gains are possible by reaching the uninsured who are eligible but not enrolled. Overall, people of color account for over half (55%) of the total nonelderly uninsured who are eligible for Medicaid but not yet enrolled, and 42 percent of those eligible for ACA tax credits to help buy private insurance.